There is a striking pattern of regularity how every time the dollar spikes, or sufficient high level, emerging market contagion usually follows. Yes, of course, "each time is different", and frequently there are idiosyncratic factors but for the most part, the one precipitating factor to turmoil in emerging markets (at first, as it then spreads to developed markets), is a sharp increase in the value of the US dollar. This is a point we made earlier in "Forget About Turkey: Asia Is The Elephant In The Room", it was also the key point of an article we wrote back in May, titled "Why The Soaring Dollar Will Lead To An "Explosive" Market Repricing." A strong USD corresponds to generally hawkish Fed in an environment where the US is recovering fast while the rest of the globe is still too slow or recessionary, or that the Fed is pushing rates above the neutral and causing excessive tightening of financial conditions and potentially triggering recession. A weak USD path, on the other hand, can materialize either as an inflation or credit (twin deficits) risk, a troubling possibility to which there is no adequate policy response. For Kocic, the relative strength of the dollar was the exogenous event that could awake markets from their peaceful slumber, resulting in a violent reassessment of monetary conditions as the Fed quietly undoes the biggest monetary experiment in history, or as he puts it, "although unwind of stimulus and Fed exit continue without disrupting the markets, the underlying stability remains local, threatened potentially by the tail risk." How does this look schematically? Causality chain of strong USD and its potential knock-on effect is shown in the chart. We start at the lower left corner. Fed hikes and strong USD open up the EM dilemma: Facing the outflows or defending the currency at expense of stifling the growth. This implies both, more volatility and potential sell off in EM, and bearish pressure on the long end of the UST that would offset the underlying bid for US bonds (strong USD is bullish). Turbulence in EM could have a knock-on effect on risk assets in the US. Why is the above critical? Because as Kocic wrote in May long before the sharp plunge in the Chinese yuan, if the cycle were to play out, it would result in the same set of conditions which led to a global bear market back in 2015 in the aftermath of China's devaluation. Well, here we are, and events are playing out precisely as they did three years ago, with two key catalysts: a stronger US Dollar, and a sliding Chinese Yuan. The punchline: the recent dollar surge, which started on April 17, catalyzed by the first (of many) PBOC RRR cuts, has launched a feedback loop which, very much like the Chinese 2015 devaluation, culminates in a very unpleasant - for the Fed - outcome: a collapse in EMs should dollar strength not be arrested, which then morphs into a broad-based liquidation of all risk assets, unless of course the Fed relents and ends its tightening cycle prematurely. 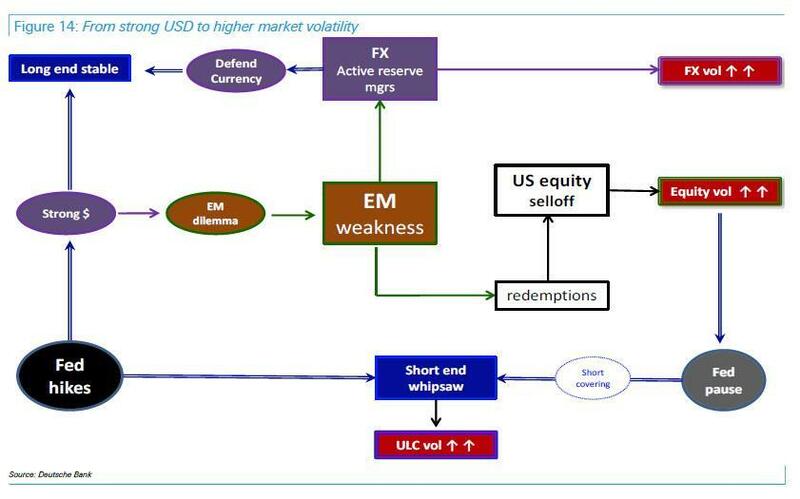 And with all the out of the way, here is what the strong dollar-emerging market contagion flowchart looks like.